The other day it was suggested to me by Brad that I tackle the subject of dance. I thought about reviewing the Watuzi, but instead I decided it might just be best to chronicle the history of dancing. And what better way than with a timeline? Click to enlarge. How in the hell do you come up with this stuff? Um...I don't see MY name or MY contribution on that so called HISTORY of yours. Just like my mother you are keeping me down. I could have been a DANCER! I could have been a SHUMKA DANCER (Ukrainian folk dancing where the guys where the red boots and jump high - YES higer than man was meant to jump - jump to the sky) but my mother never loved me enough. I remind her of that all the time. I could have been a dancer. Very funny, TS. I especially like the captions for 1977 and 2005. Great post and super creative timeline.... But no reference to 'Pants Off, Dance Off'? Ha. The lindy hop one was great. I have a work presentation coming up about service-oriented architecture, I may slip this in. 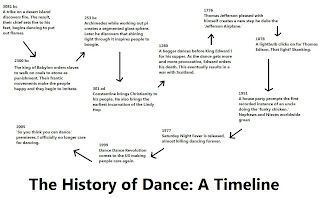 Engineers love dance-history.